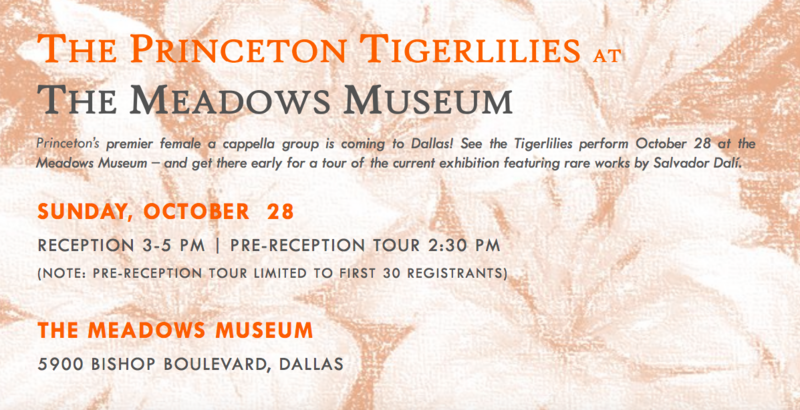 The Princeton Club of Dallas-Fort Worth (PCDFW) is thrilled to welcome the Tigerlilies, Princeton’s premier female a cappella group, to Dallas for their Fall Tour! Join us for an afternoon of a cappella and art at the Meadows Museum. The Tigerlilies will perform short sets throughout the afternoon. Refreshments will be served. Go to the Eventbrite page for more information and to purchase tickets. Reception & Performance – 3:00 – 5:00 p.m. | Pre-reception Tour – 2:30 p.m.
Come early for a pre-reception tour of the current exhibition featuring rare works by Salvador Dalí, led by museum director Mark Roglán. The tour is limited to 30 participants and will begin at 2:30pm. Free parking is available in the parking garage underneath the museum. The museum is located on the edge of the Southern Methodist University campus (on Bishop Boulevard) one block north of Mockingbird Lane. Garage entrance is at the corner of Bishop and Schlegel.